These are articles that we've written based on our real client experiences in the past. We're sure it will help with your planning so you get the most out of your event. Of course, nothing will go wrong on your big day - but better safe than sorry. Here's lists for both brides and grooms to prepare for your big day and ease up on the stress of remembering the things you need to take. A great way for us to get to know each other better, and provides a fun way to get some fantastic pictures of you both - before the big day. Stuck for what you need to ask the priest or vicar, Our guide will help you ensure you ceremony be a memorable, relaxing and enjoyable one. Things that matter and things that didn't! We ask newlyweds for tips and opinions on areas they thought were a waste of time and money but to also give us some tips and advice on picking up bargains and help with your wedding budgets. Photographers - what to look out for? Talking to your photographer is key, here are some other areas that might be worth mentioning to your photographer to get the most out of your day. Hundreds of DJ's out there and you are be sure to always find a "cheap" DJ...it's finding the RIGHT DJ that matters! Take a look at DJSPACEBAR in action. We're so MUCH more than just music. 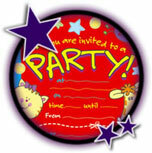 Want help designing your Party invites? As part of our services, we can give you advice and assistance to help design a party invite for you - choose from ones we've already done..
Give the girls a head start by sending them this link as well as talking them through it. It will make their lives easier and they'll appreciate the help. What "will" & "could" annoy your guests..
Read some previous comments from Brides who once were guests at weddings on guests gripes to consider when planning. Let us help save you some stress by providing you with some starting tools to help plan your day/evening more effectively. You'll be surprised how organized you can be and how much time you will have saved. From our experiences dealing with lots of newlyweds, you'll be surprised what hidden surprises venues might not want to reveal - till asked...check out what to ask for up front! After some cameras for your event?. We can provide them to you customized OR you can discover how you can get them for FREE in October 07. Finding Wedding Vendors can be hard, by working alongside these vendors, we've singled out the best from the rest - They'll work in your favor not theirs. Professional DJ's and entertainers should be respecting the noise levels around you and the event. Everyone wants to have an enjoyable party so no one needs to deaf.. If you can squeeze it in your budget then have both to satisfy both types of crowds. 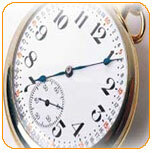 Check our article out on timings and band sets. Any Plans to iPod Your Wedding or Party? More and More people are asking about using their IPOD for their wedding. Here's what you need and some advice. 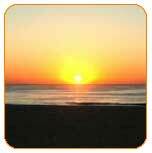 Sunrise and Sunset times for your special day. We can't plan for the weather but can help you, plan your day by understanding Sunrise and Sunset times. Most folks that you'd like might not be able to make it abroad, so if your having a party back home, why not add to the celebrations by projecting the pictures of your wedding day at the reception party! Stuck for that 1st Dance Impression? Check out what we've played in the past as well popular tracks as surveyed by 1300 UK DJ's. Traditional 1st dance, Your own song or something that shows both your personalities?. 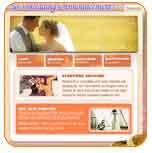 Take a look here to see what others have done - Caution:-"Fun"
It can seem quite daunting organizing your special day. Check out our article from advice and experiences we've had with helping couples plan ahead. Stuck for ideas on music?, Your play list has No.1 priority but want some inspiration to keep your guests happy too? Without Music, a civil ceremony will seem short, having music enhances your wedding vows to give a little more atmosphere, style and substance to your ceremony. 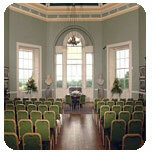 Take a look here to see what should be played during the most important phases of the ceremony. Check out this article which gives you some tips as well advice and things to think about when working with a live band. A DJ for your wedding that guests won't be dreading. Check out this article and arm yourself with the information you need to ensure your guests don't end up going home early. 4 You'll deal exclusively with the crew Josh (the DJ) from start to finish. Kamaran (the MC) is the polished professional speaker and communicator. His announcements will be crisp, clear, and easy for you and your guests to understand, in a voice that is friendly yet commands attention. 4 If its for your wedding reception, we will lead you, step by step, through all the planning process of wedding formalities, music and pace. This includes Grand Entrance/Introductions, First Dance, Parental Dances, Cake Cutting, Garter/Bouquet, and any other events you desire. Its your wedding so let us help you work it the way you want to. 4 You will be asked questions to determine what you want, we'll give you straight answers to those questions, with no pressure or hype. On average, we invest around 10/15 hours with you - even before the wedding has started so you will find the process fun and enjoyable. We want you to feel fully prepared and confident prior to and during your wedding! 4 Everything will be done in a fun, classy and elegant manner. You will never be made to feel embarrassed or awkward. 4 Professional appearance is a must! Both Kam and Josh wear clean black shirts, trousers and shoes. Our equipment is professional grade and gives forth a clean, impressive appearance. We base our sound and lighting around your reception venue. You will be treated like the VIP you are! our goal is to begin a successful long-term relationship with you, and perhaps your family and friends? a relationship that can hopefully last for many years. This can only be accomplished by building your trust now. Our goal is to exceed your expectations to the point that you wouldn't even consider going elsewhere! We look forward to working together. Come and talk to us - thats all! Let us know your plans for your dream wedding! If you are passionate about your weddings success then we're interested in making it a success for you! STEP 1: Enquire about our services. Thank you for sending an email and showing your interest. Hopefully in your email you will have provided information about yourself (you and your partners name) and the wedding venue (if booked). Let us know how many guests attending and the important date. If you could tell us what out of services from our website that interests then that would be a great start!. You might want to check here to see if your venue is listed and if you are not sure about the financial aspects of DJ services, don't worry, click here to see what you should be setting aside for your entertainment budgets. We endeavour to respond to all emails as soon as possible - we appreciate that you need to get your entertainment part booked so we will do our best to get you your answers as soon as possible. . If the date is available in our calendar - GREAT! then we move onto Step 3. If not we will try and help you where we can and give you free advice and direction where possible. We are not an agency not do we recommend 3rd parties - we simply cannot vouch for other people and we'd not want to give you any bad experiences but we will send you in the right direction. In all cases, when booking a DJ for your reception, you should always try and meet your entertainment company and so we prefer this and we'd like to meet with you. 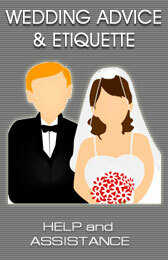 This meeting will gives you a chance to assess us to see if we are the right people for your wedding party. We request that you arrange a demonstration with us, either at our location. After your meeting, If DJSPACEBAR is not for you, then all that we ask is let us know where we might have gone wrong - we're a customer facing team so we learn from our mistakes and always improve on them . If you are still interested in DJSPACEBAR then we will be by your side in helping you organize a smooth and professional event. We have helped many clients ensure that they get maximum value from their once-in-lifetime events. Quite Simply - Every Event is DIFFERENT! and this is why there is no fixed price. Every event is tailored to your function requirements. All packages are calculated on an individual basis depending on you. You might decide that you want your event to start and end at certain times on the evening (pls allow for setup/teardown time), or your venue requires lighting appropriate for the size of the room. The same applies with the sound system, depending on how many people you are expecting also dictates the sound system used. The more you tell us about your event, the more we'll be able to build a package for you that will be professionally suited for your event. All our equipment is designed with subtlety in mind and will look clean and professional for your event. All these things are considered when we price any job. 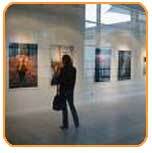 Our service is very bespoked and we'll throw in some ideas and efforts to enhance the event. You can be assured of a professional approach and we guarantee a personal & flexible service. We can provide examples of packages to show you what you can expect and we'd be happy to consult this with you. Contact us with the above information so we can tailor make a package around you. Our enthusiasm and passion for making your event truly successful is the single biggest piece of value which can't easily be shown through a website. We believe this will come across in a one-on-one meeting. We're passionate about our work...We have experience from years of performing and planning to create a DISCO show with lots of entertainment value that separates us from the image of your traditional DJ. We came into this market because we were frustrated with the lack of interest and enthusiasm shown by other DJs performing at weddings. Disappointing Sound and Lighting, no energy, enthusiasm and bad sound tastes. We dance and motivate your crowd to get them in that party atmosphere! We believe everything for your event is focused around the style, image and atmosphere the DJ creates and we knew we could do it better than anyone else by spending the time to "listen" to what you want and carrying out the reception that you've been dreaming about for years! "You guys have it - you know how wedding receptions work"
Can we choose the background songs for the Slideshows? Absolutely, we'll play these songs and mix these into the playing lists when the Video slideshows are projected. We have identified allowable distances from our base. Specified here. One price includes everything we do with no hidden charges or fees. What assurance can I have that you guys will give me what I want? Your email confirmation is your guarantee from our services, we will be in constant communications with your throughout the planning and we hope to create an informal dialogue with you - we like to know our clients as friends as well. If you sign up to us for your entertainment, we'll set you a dashboard pane that will keep both of us up to date with every aspect of your event. We'll give you assistance with music and let you have access to previous member play lists to jog some dancing memories. To avoid disappointment, book as early as you can, as soon as we've established your requirements, possibly met up with you, discussed and confirmed your options and taken a 10% (non-refundable) deposit you will receive an email or written confirmation from us verifying our attendance for your event. If a deposit has not been sent and we do get a follow-up interest on your party date. 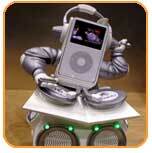 DJSPACEBAR will try and contact you several times through all the contactable means we have on file with you. If we are unsuccessful then we will send a final reminder mail and make contact with the interested 3rd party. How do you prevent going over budget and staying under - simple - stick to what is important to you and whether you need it. The entertainment is often the last part considered for a wedding day - strange because its the longest part of the day and the part most largely responsible for the success of the big day, remember it's the last memory your guests will have about your day. In all the successful weddings we have been a part of, clients realize the entertainment is the fun and exciting part of the day. Here's the top areas our previous brides have found to be important for their day. It is estimated that the average Wedding costs in the UK around Ł18000 to organize. DJSPACEBAR suggest that you should consider between 5 to 10% for your entertaining budgets, the entertainment will be largely responsible for the success of your big day and the aspect most of your guests will remember more than any other. The entertainment isn't something you should be cutting corners with -- it will leave the party feeling very flat and reflect badly on you if you get a less than outstanding Wedding DJ. Shouldn't your first question be "Are you a good DJ?" !!! Bear in mind that one DJ won't be the same as another DJ. Everybody has different skills, talents and presentations. Great referrals and testimonials are the best way of confidently trusting a service. We all know that in all markets you get for what you pay for and the DJ market is just the same. It's great to get a good bargain. Many customers like price shopping to see where they can get the best deals or value for their money. Many clients often approach DJSPACEBAR and ask what and where in the scale of budgeting they should pay for a top class DISCO. We appreciate all customers should have a good idea of what a DJ might charge which is why we've made this chart available. Having a good idea of budgets will give you a approximate idea, of how far your budgets should stretch. Here are some statistics on what DJ's are charging currently (in 2005). These are figures based on all different levels of DJ's from around the country and what they charge on their Mobile Disco and the kind of event they do. This is only to give you an idea of the scale of DJ charges from a beginner to the professional. 77% of DJ's across the country will be increasing their fees for 2006. The DJs United (http://www.dj-forum.co.uk/) Community consist of around 3000 members who are professional entertainers at all levels. 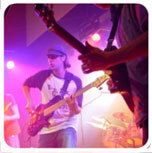 These range from beginners right up to large scale celebrity events hosted by professional DJ's. We can work with you to advise/review your music or even provide previous play lists to help compile and build your play list. There are DJ's out there that offer what you do? You may be right, however we've not found anyone in our years of service that can compete with us - please tell us if you do!!. Competition - if found is good. Anyone can play music at an event but we're confident that our services are unique. We're Wedding specialists interested in enhancing your wedding only and we use theatrical surprises, entertainment, great music and pace at your event to enhance the atmosphere for your guests. If you want your wedding to be an average disco, there are lots of DJ's out there who will help you, if you want your event to be a great disco but different and individual then we can help you. Many DJs may well provide the services of Slideshows, DVDs etc as add-on options. With DJSPACEBAR we provide all the professionalism in-house so we're confident about all aspects of our service to you. Compare us to other companies and find quotes that will match our services and tell us about it. Do you have cordless microphones for the DJ service? YES. We use Top quality Shure products. This is essential to us as it gives us greater control and freedom. SPEECHES: Can we use your microphone for them? YES. As long as you allow us to setup in time, you are happy to use our equipment for speeches. Wedding Breakfast: I'd like background music? YES. Let us know your plans your wedding breakfast and we'd be happy to setup our equipment in an appropriate place to play music (light jazz or your choice) while your guests are eating. Yes, we can help. Let us work with your best man if they want to perform a presentation during their speech, they can use our projection screen and equipment during this. We will work with them to help them build a PowerPoint presentation designed just the way they want it. Contact us for more information. Yes, we can help design table settings designed for your theme and style. Contact us for more information. If I want a song you don't have, can I play mine? Yes, and we will make sure that we get hold of it before the event - it fits in at just the right time so that it becomes part of your library of memories on your wedding day or event. I'd like a Mirror Ball, can you supply that? Yes, this and many other extras can be supplied on request. This is dependant on positioning within the venue. We can work with your Party/Wedding coordinator to achieve this. While copyright protects the rights of copyright owners, it also seeks to promote the free flow and exchange of information by providing a number of ways that third party copyright material may be reproduced or communicated*. Parts of the DJSPACEBAR website may use references to statistics, reviews, resources, surveys and links gathered from external sites. In the event of copyright breach, please contact the owner of this website so this can be followed through with their website designers.